In January we held the 34th Annual Futures Unlimited Awards Banquet and congratulated seventy-seven local high school students. These students took a three-month-plus journey to image, create, and run their own small businesses. The three mini-companies formed this year included T.H.R.I.V.E. sponsored by Bank of Hawaii, GX3 sponsored by Big Island Toyota, and Aloha Supplied sponsored by HELCO. 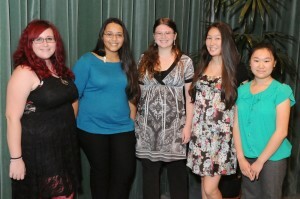 During the banquet $3,500 in scholarships were awarded to five deserving students. The winners included, Brianna Kaalakea from Kamehameha High School, Laurel Fongblatt from Hilo High School, Volandou Gronowski from Pahoa High School, Yan Ying Huang and Jennifer Taniguchi from Waiakea High School. These scholarship monies and the other awards presented were paid for from the proceeds generated by “taxing” the earnings of the JA companies. All of our sponsoring firms instill the value of community service in their employees and set excellent examples for our achievers. Students visited the elderly and veterans, made cards for the troops, packed operation Christmas child boxes, staffed various community events, sold wristbands to raise funds for charity and donated products to worthy causes. This year’s winner for Community Service was GX3 sponsored by Big Island Toyota. The evening culminated in the prestigious, Company of the Year Award. It was an extremely close competition this year and all of the companies did a terrific job. Aloha Supplied sponsored by Hawaii Electric Light Company took top honors and President, Brianna Kaalakea and all vice presidents were welcomed to the stage with a roaring applause. The excitement of the evening was shared by all parents, volunteers, board members and sponsors who helped make this program a huge success. Junior Achievement thanks Big Island Toyota, Hawaii Electric Light Company and Bank of Hawaii for their incredible support. To get Junior Achievement in your K-12 classroom or to get involved yourself as a volunteer or a sponsor contact District Manager Susan Labrenz by phone at 966-8450 or by email: jahawaii@gmail.com. 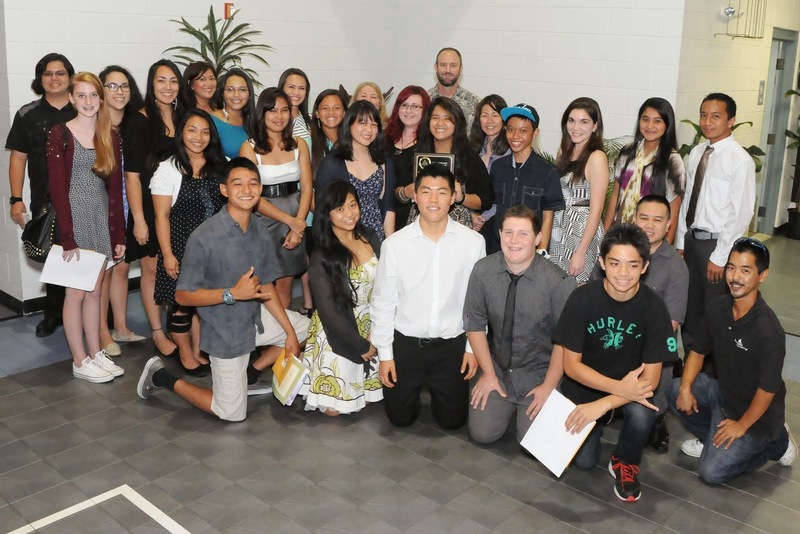 Hawaii Island high school seniors who have participated in Junior Achievement programs can apply for 2013-’14 JA of Hawaii Island Scholarships. 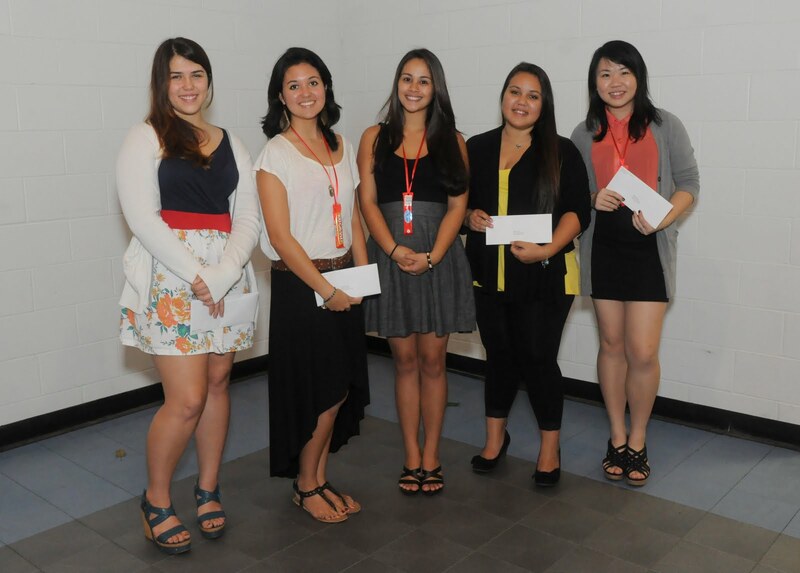 Junior Achievement of Hawaii Island General Scholarship recognizes and encourages the academic achievements of graduating seniors. This year again, we would like to encourage students to apply for our scholarship. The number of available scholarships and the amount of each scholarship is subject to change from year to year. Typically, there are two to five scholarships awarded each year, ranging in amount from $300.00 to $1,500.00. The application along with the required supporting documents must be postmarked by December 2, 2013 or hand delivered to the District Manager, Susan Labrenz by 9 PM December 3, 2013. Update 10/28/2013: Thanks to all who participated, we raised nearly $1,000 plus the contribution from Foodland. Mahalo! Our organization is participating in Give Aloha, Foodland’s Annual Community Matching Gifts Program. This program honors Foodland’s founder, Maurice J. “Sully” Sullivan, and continues his legacy of giving back to the community. Click here to download the Give Aloha flyer to make giving even easier. 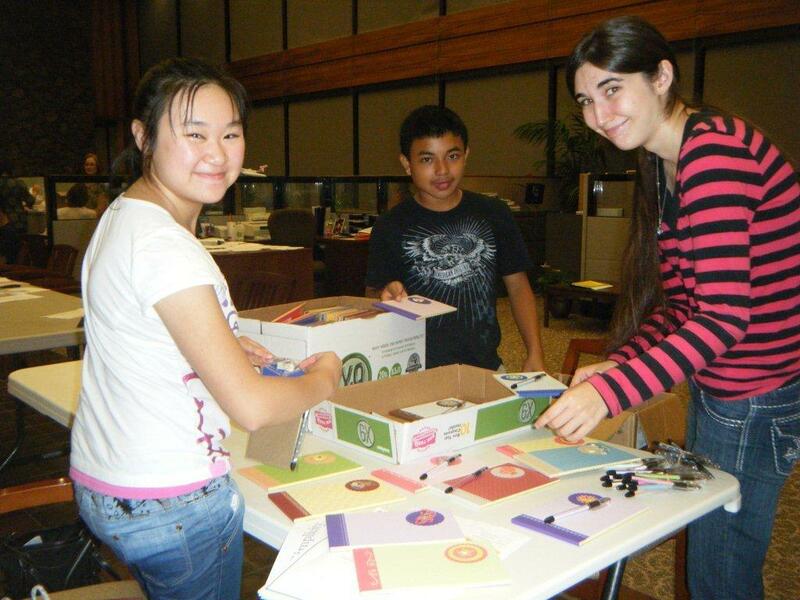 Learn how you can help support Junior Achievement of Hawaii Island through this program. From September 1-30, customers are invited to make donations up to $249 (per organization, per person) to participating Hawaii non-profit organizations at checkout. Individuals must use their own Maika’i card to make a donation. Foodland and the Western Union Foundation will match a portion of each donation made with a Maika’i card. Donations made without a Maika’i card will not be matched. The Western Union Foundation has generously donated $100,000 to add to Foodland’s gift of $250,000 to Hawaii non-profit organizations participating in Give Aloha this year. Therefore, the total gift that will be given to all participating organizations combined is $350,000! At checkout, present your Maika’i card (or give your 10-digit number) and inform the cashier that you would like to make a donation to JUNIOR ACHIEVEMENT OF HAWAII ISLAND. If you do not have a Maika’i account, you may establish one by telling the cashier you would like to do so; you will need to give a unique 10-digit number (such as your phone number). Tell the cashier how much you would like to donate. Your donation will be added to your grocery purchase total. You may donate up to $249 per organization (any amount in excess of $249 per organization will not be matched). Be sure the cashier reaffirms our organization’s name and amount that you are donating. Any donation must be made payable to Foodland, Sack N Save or Foodland Farms. The name of our organization and the amount you donate will appear on your receipt. Donor names will not be released to our organization. If you would like us to know of your gift, please contact us directly so that we may properly acknowledge your gift. You may donate up to $249 per organization over the course of several store visits. You may make donations to more than one organization. Are These Donations Tax Deductible? Give Aloha donations are tax deductible to the full extent of the law. Please save your store receipt for tax purposes since it will be the only record you will have of your donation. You may ask the cashier for a duplicate receipt. How Will My Donation be Matched? Every year, the matching gift percentage varies and cannot be pre-determined. For the past 5 years, the matching percentage has been between 22%-26%. Thus, if a customer donated $100 to an organization, Foodland and the Western Union Foundation’s matching gift was $22-$26. The actual matching gifts will be calculated at the end of the program. Organizations will receive 100% of all customer donations given to their organization, plus their % of Foodland and the Western Union Foundation’s $350,000 matching gift. The portion of the matching gift that each organization will receive will be based on the total dollar amount of customer donations designated to that organization as a % of all customer donations received for all organizations. For example, if total combined customer donations for all participating organizations equal $1,000,000, and $10,000 (1% of total) in donations are designated for JA Hawaii Island, then JA Hawaii Island will receive 1% of $350,000, or $3,500 from Foodland and the Western Union Foundation’s matching gift in addition to the $10,000 from customer donations. Total gift to JA Hawaii Island = $13,500. 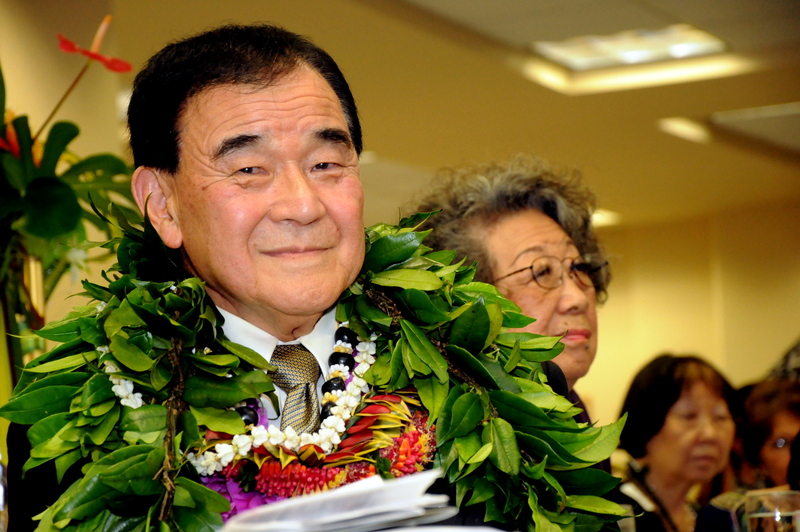 On April 20, 2013 Hilo gathered at the Hilo Hawaiian Hotel to recognize architect Russell Oda, the 2013 Big Island Inductee to the Junior Achievement of Hawaii’s Business Hall of Fame. This state-level recognition for Russ is well deserved as you’ll find his signature on distinctive buildings throughout the islands.